A stressful workday can be crippling. We’ve all been there before: something just isn’t going right, or perhaps you’re just not in the mood, and from there everything seems to snowball. Small challenges can seem big, basic productivity can become a challenge, and you can become exhausted or irritable. It’s perfectly natural that this should happen occasionally, but it’s also a good idea to have some tools in your back pocket as to how you can go about dealing with it. 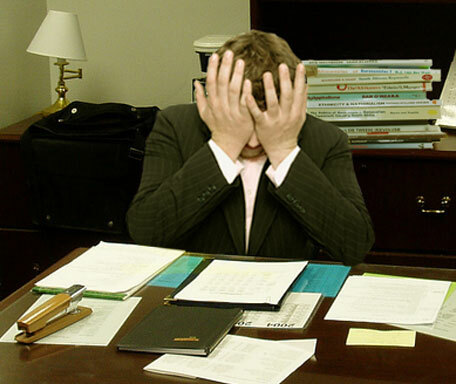 SO without further ado, here are five tips for how to making things better during a stressful day at work. Writing a list might sound a little bit stressful in and of itself when we’re talking about the idea of feeling overwhelmed. But it can actually be helpful. An article on “mastering the art” of the to-do list described it about like we would: as an age-old productivity tool, valuable even if they often wind up not being completed. When you’re feeling stressed out or too busy at work, consider literally sliding your chair back, turning aside, and writing out a list, either on paper or your phone, of what your top priorities are to get through the day. It serves two functions: first, you get to disengage for a few moments from the actual work and catch your breath, and second you can give yourself a minimalist, sensible plan of attack for the remaining hours of the day. This might not be an option, depending on your job. That said, more and more occupations and industries allow people to work from home, at least some of the time. Even if you don’t make an ordinary habit out of it, this can be a great way to change up a rough day at work. Note: this isn’t a suggestion to merely take the day off (which can lead to more frustration later on). Rather, it’s just a chance to get away from the office, decompress, and resume work at home in a more comfortable environment. This is a common idea, and it’s one that may have been best explained in a piece written just last month about how gamers can stay focused. That piece quoted a poker psychologist commenting on frustration and anger, noting that anger can prevent us from making logical decisions. The solutions that followed involved various breathing techniques (such as deep breathing, Sama Vritti, and the increasingly popular “alternate nostril breathing”). These techniques really can help us to ease away from the anger and frustration that come with high-stress situations, such that we can avoid those issues with logical decision-making. There was an article by Bustle that listed tips for surviving “a super long work day,” and we couldn’t help but notice two of them basically involved getting away from the desk and having a treat. One was to bring snacks, and the other was to schedule in coffee breaks. Together, these speak to the idea of getting away from your desk when you start to feel stressed, and possibly getting out of the office altogether. Head to a common area or walk to a café down the street, have yourself a coffee and/or small snack, and make your way back. It’s a reasonable break, and it can totally recharge you. You don’t want to complain too much – and probably not at all to your boss or any other superiors – but there’s no harm in letting it be known that you’re having a rough day. Maybe you can vent to a co-worker over lunch, or if you’re allowed to have a chat up on your computer or use your phone to text, you can even talk to a friend and let out some frustration. It can be cathartic, and in fact can even make the situation feel a little more amusing and a little less permanent. You could be back in a productive mode in no time. “What is the right career for me?” is the question people ask themselves when they are at a crossroad in their lives. While doing what one loves is the best way to choose a career, not everyone may be given the opportunity to do so especially if the chosen career can’t pay the bills or provide for the family. Most people would just dive into what is laid before them. The sad thing is that they are doing the things that they do not even like. But the reality of it all, most people spend 20 years or so before finding the right career for them. So if you are in the verge of choosing the right career, here are the things that you can do. Before immersing in a chosen profession, it is best to assess yourself. The factors that you need to consider are your skills, values, personal traits and interests. Also, you need to consider what you are passionate about, the kind of lifestyle you want, religious beliefs and ethical guidelines, people you want to work with and the kind of service or product that you want to contribute in the society. Most importantly, you need to assess yourself whether you’d want to continue to work for other people or be your own boss in the future. Knowing yourself is great but it may also be a great idea to seek help from a career counselor especially if you have just graduated from college. They can help you in evaluating your skills and interests. If paying for the career counselor isn’t an option for you, search the internet for free career assessment tools. If you have experienced working already, ask the people whom you have worked with for honest feedback of your strengths and weaknesses. These people may give you insights on what they think you can improve on, do less and on how you can be more productive in the future. Improve on the skills that you already have. If you love what you are currently doing, continue doing it and perhaps, develop them into a higher level. For example, if you are good in public speaking, look for a job that would allow you to use such skill. This way, you can be better at it. Also, it doesn’t hurt to learn new skills too. For example, if you are keen in learning how to graphics design but you are not a computer techie, enroll in short courses or learn from free video tutorials online. Try to learn as much as you can and when you can. As you go along, you’ll surely be good at it with constant practice. When you have listed down all the possible careers that you can pursue based on the factors you have considered, you can do a job search. Apply for jobs which you think that best suit you and the can help you sharpen your skills. It doesn’t matter if your skillsets are in a beginner stage, what matters most is that you are willing to take on the challenges and improve on them over time. In this day and age where technology plays a major role in choosing a career path, building a wide network will help you find the career right for you. There are several networking sites such as LinkedIn and Indeed, etc. that can help you connect to people that have the same interests and skills like you do. In these sites, you can also get invited to different events and job opportunities. You could also find people that can mentor and help you build your career. Building up a solid network may take a while, but once you have built these networks, these people can also become your future clients too. You need to be up-to-date on the development and news on the industry you want to be in. By keeping yourself updated, you’ll know job vacancies that you may be able to fill in. Continue to search for new possibilities but be careful not to jump from one job to the other. Finding the right career takes time especially for those people who are troubled with possible constraints that hinder them from doing they really want to do. What is important in the process is that you are enjoying what you do and it makes you find your true purpose that will also inspire others around you.